Drury Lane, Newtown — Truffle Pig. Oconnell Street Merchants have now closed their doors, making way for a fresh new venture in Newtown. Occupying the tall space upstairs from Brewtown, are two home grown projects. One, Sydney Romantics, a Sydney-based, Sydney-love label a few years into the groove, with hopes to one day sport threads recognised world-over. The other, is an off-shoot from North Hobart's Sweet Envy - an acclaimed bakery and Patisserie run by Alistair Wise. Alistair's kitchen roots run deep. As the son of household name Sally Wise, famous for her cookbooks happily being held in bookshelves around domestic Australia, Alistair began his apprenticeship in homestate Tasmania, and after scooping up a couple of top-shelf awards, the road ran via Melbourne and over to the UK to work with the likes of Gordon Ramsay. Drury Lane is a feast for the eyes. Not only are the golden brown baked delights showcased in polished cabinets awaiting your viewing, the cabinets divide the work station area to watch on and appreciate the work that goes into the product. They've also got a speciality coffee bar for pourover styles, although, all your regular favourites are still available from Brewtown who bring everything upstairs. To start, many of Sweet Envy's favourites have made the trip up North. The Witherspoon ($7) sits upon a chocolate shortcrust lightly lined with Plum. There's a peanut mousse hiding underneath a layer of dark chocolate, peanuts and pretzels. The Pecan Sticky Bun ($7) is well known in Hobart, and will no doubt also be the case in Sydney before too long. Perfectly cooked pastry is doused in salted caramel without all the sweetness one would expect. There's a crisp outer, and warm, soft interior, it's the minimum order when visiting for the first time, and also great for those not usually penned to have a sweet tooth. For those without a sweet tooth, or seeking a second course to an earlier lunch, Drury Lane offer savoury pastries ($7-$8). Expect goodies like Lamb & Harissa, Pork and Fennel and Cauliflower Cheese. 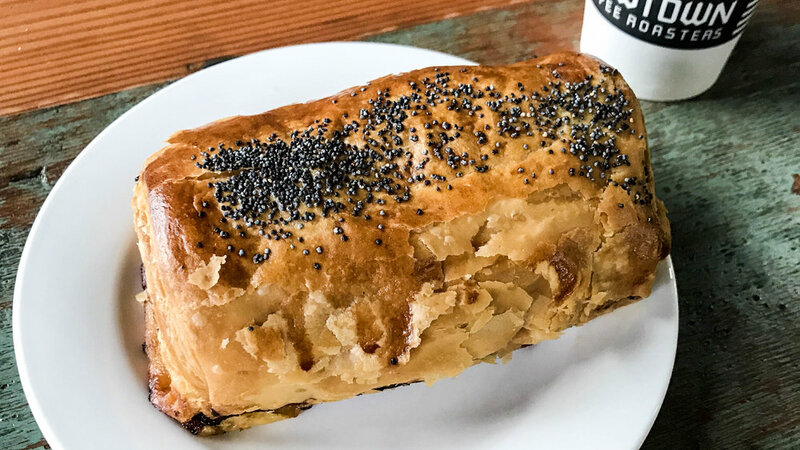 The Pastry in the Lamb and Harissa Sausage roll is delicate and flaky, the lamb appearing pink from the harissa mix. It's lightly spiced but packs a punch in terms of flavour. Long gone are the days of the canteen sausage roll, well-bound from far too much egg. The lamb mix soft yet holds form without crumbling. There's a warmth to the service and a distinct, and welcomed slower pace - perfect if you need to escape the buzz that is often felt downstairs at peak times. Whilst Drury Lane appears to cater more for takeaway, goods are brought to table for you to sit down, enjoy and while away enjoying tunes spun from the decks some footsteps over at Sydney Romantics.